Most home buyers know that new homes offer outstanding advantages: They’re built to incorporate better energy efficiency, have lots of modern amenities and the latest safety features, and have floor plans to fit a variety of lifestyles. With all those enhancements in mind, it’s important to select a builder who has the skills and knowledge to deliver an experience and home that you and your family will enjoy for years to come. Customer service: An NAHB-member company that’s truly committed to client satisfaction will emphasize outstanding service from every member of its team and maintain a professional approach in every interaction. Quality: Be careful when assessing the prices set by different builders. The quality of the materials and service can make a significant difference in cost. You get what you pay for. Integrity: Is your prospective builder trustworthy? Be cautious if you hear anyone suggest that a builder has been less than honest with clients. Commitment to education: Professional builders know that the quality of their service depends on ensuring that their team members have the tools to be successful with professional designations and continuing education. References. A reputable builder will be glad to provide you with names of former clients, as well as suppliers, subcontractors and consultants such as architects and engineers with whom they’ve worked. And here’s the best advice of all: When selecting a builder, consider hiring one who holds a Certified Graduate Builder (CGB) or Graduate Master Builder (GMB) designation from the National Association of Home Builders. Builders who have earned the CGB or GMB designation are experienced professionals who have voluntarily engaged in professional development and other continuing education opportunities. Candidates must have several years of building experience before they can earn the CGB designation. They are required to take courses on building technology, finance, project management, sales and marketing, and safety. Before graduating, they must sign a CGB Code of Ethics and provide proof of the appropriate licenses, registrations, certifications and insurance required by their state. The requirements for GMBs are even more stringent. GMBs must have already earned the CGB or the Certified Graduate Remodeler (CGR) designations and have a minimum of five years of experience. If they don’t hold either designation, they are required to meet specific education objectives and have been in the building industry for a decade or more. Once they have earned their designations, CGBs and GMBs must complete 12 hours of continuing education every three years from a specific set of building industry-related events. This ensures the builders stay knowledgeable on the latest industry trends, rule changes and other important home building industry information. 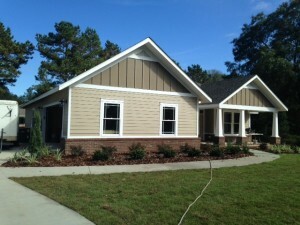 To find an NAHB-member builder who holds a professional designation in the Leon County and surrounding areas, or to request a copy of the Build with Confidence: Hire A Certified Graduate Builder or Graduate Master Builder brochure, contact the Tallahassee Builders Association at 850.385.1414. You can also search for Certified Graduate Builder (CGB) or Graduate Master Builder (GMB) designation holders at www.nahb.org/designationsdirectory.